We all need oxygen to survive, we obtain this oxygen through the air we breathe. Our lungs are the organs of our body used to absorb this oxygen which then passes into our blood stream and around our bodies. The lungs also remove the waste gases in our blood stream back out into our breath which we then breathe out. The most important one of these being carbon dioxide. Our lungs or respiratory system starts at our nose and mouth. As we take a breath the air passes through our nose and mouth, to the back of our throats (called the pharynx) down to our voice boxes (Larynx) and on down into our windpipe (trachea). 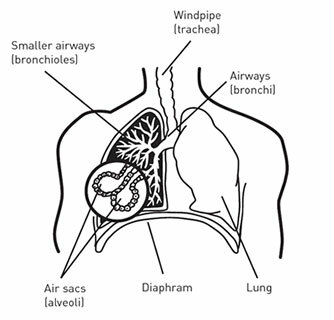 Our windpipe then divides into two separate air passages (called bronchial tubes). Each of these tubes delivers air to each lung. As these tubes progress down through our lung tissue they further divide into narrower (bronchi) and finer tubules (bronchioles). The smallest of these tubules end in tiny air sacs called alveoli, where the oxygen and carbon dioxide gas replacement happens. Once the blood has absorbed the oxygen it travels to the heart where it is pumped throughout our bodies to supply all our organs and tissues with oxygen. When our body uses up this oxygen it produces carbon dioxide which is released back into our blood stream and carried to the lungs. This waste gas is then removed from our bodies when we breathe out. Thankfully our respiratory system has many built-in defence systems to prevent substances which could cause our lungs damage from entering into the smaller airways. When healthy our lungs are soft spongy and are a pinkish grey colour, they are also elastic and expand and relax when we breath in and out. In contrast lungs which have been exposed to long term pollution or smoke appear to have darkened spots on the surface and loose their elasticity. When this happens the lungs can no longer expand and relax effectively, which leads to problems transferring oxygen into our blood stream. This can cause difficulty in breathing and as our tissues and organs are not getting enough oxygen our body tires easily, other difficulties can also occur to other body systems as a result of low oxygen levels in our blood stream.